Hemet Valley Medical Center is a 327-bed hospital that places the needs of the patient first and foremost, focusing on excellent clinical outcomes, patient safety, and exceptional service. 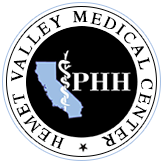 Founded in 1943, Hemet Valley is fully accredited by The Joint Commission, serves as one of the largest private employers in the San Jacinto Valley and is owned and operated by Physicians for Healthy Hospitals, Inc.
With a full array of inpatient and outpatient services, our team of physicians and healthcare professionals is focused on Quality, Service, and Satisfaction. We are committed to providing measurable quality with excellent clinical outcomes, patient safety, and exceptional service. We listen to our customers - patients, physicians, and employees. Visit the Administration page for more information. We want to be your community hospital. Trust us with your care.